While he was walking out of the Capitol after his first State of the Union address on Tuesday night, President Donald Trump signaled he would release a controversial secret memo that targets the FBI the US Justice Department. Rep. Jeff Duncan could be heard telling Trump, "let's release the memo," as the president shook his hand. "Oh, don't worry. 100%," Trump replied. He quickly added: "Can you imagine that?" 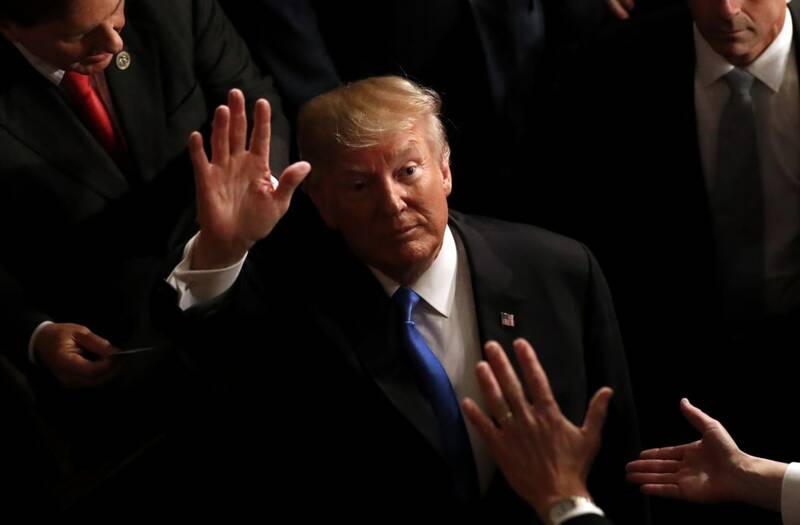 As he walked out of the Capitol after giving his first State of the Union address on Tuesday night, President Donald Trump indicated that he will release the controversial secret Republican memo that targets the FBI and Justice Department. South Carolina Rep. Jeff Duncan told Trump "Let's release the memo," as he shook Trump's hand. "Oh, don't worry. 100%," Trump said, adding "Can you imagine that?" The memo alleges that officials at the DOJ and the FBI did not disclose that the Russia dossier — which was used to obtain a FISA court warrant to spy on former Trump campaign adviser, Carter Page — had been partially funded by a lawyer linked to Hillary Clinton's 2016 presidential campaign. The dossier was first financed by a group of anti-Trump Republicans after Trump won the party's nomination in 2016. Deputy Attorney General Rod Rosenstein, who was appointed by Trump, later authorized further surveillance of Page. Both Rosenstein and top brass at the FBI — including the now-ousted deputy direct Andrew McCabe — are in the Trump administration's crosshairs as the Russia investigation gains steam. House Intelligence Committee Republicans on Monday voted to release the memo that accuses the Department of Justice and the FBI of improper spying amid the Russia investigation. The DOJ said releasing the memo would be "extraordinarily reckless." Broadly, the vote indicates that Republicans on the committee view the use of the dossier to dig deeper into Page as evidence of bias against Trump. The president previously indicated his willingness to make that memo public. Democrats are livid about it. They have produced their own memo that they say adds necessary context to the Republican document.